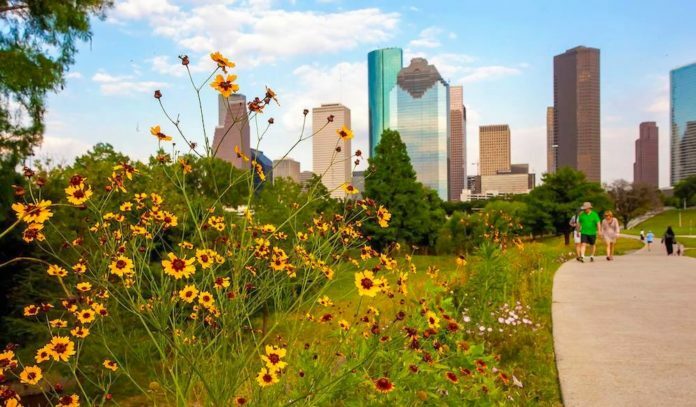 Stretching from Shepherd to Sabine, Buffalo Bayou Park offers 160 acres of picturesque scenery and skyline views, along with stellar hike and bike trails, performance and outdoor activity spaces, art installations and more. With its epic renovation, the urban park has become a crown jewel of Houston, making it the perfect place for a stroll. The Water Works – This major park destination sits on a four-acre water system site that was once abandoned by the City of Houston, rocking The Brown Foundation Lawn and Hobby Family Pavilion for performances and events. Wortham Insurance Visitor Center at The Water Works – Located on Sabine between Allen Parkway and Memorial, this visitor center serves as the primary gateway to the park, with restrooms, a staffed information desk and a bike rental facility operated by Bike Barn. The Cistern – Underneath the Water Works at Buffalo Bayou Park, this 87,500 square foot, 25-foot tall cistern—reminiscent of the ancient Basilica Cistern beneath Istanbul—dates back to 1926. The former drinking reservoir was much forgotten after it was closed due to an irreparable leak; that is, until 2011, when the Buffalo Bayou Partnership re-discovered it during the development of the Buffalo Bayou Park. Realizing its architectural splendor and historical significance, the group worked with the City of Houston to open the industrial relic to the public, even hosting a series of art and light installations and guided meditations. You’ll have to make reservations to get a look, and you should. The 30-minute docent-led tours are available by reservation. Tickets are $8 to 10 per person for installations and $5 for history tours when there are no installations (free on Thursdays, but reservations are still required). Lee & Joe Jamail Skatepark – Right off the Sabine Street Bridge with closeup views of Downtown, this state-of-the-art skatepark offers over 30,000 square feet of course and obstacles for both novice skaters and seasoned riders. Helmets are required. Open daily from 9am to 10pm. Barbara Fish Daniel Nature Play Area and Picnic Pavilion – Near the skatepark and Water Works, this playground was designed to inspire a love of nature, offering fun activities like a boulder rock scramble, rolling lawn, stream and waterfall, and 33-foot slide. Eleanor Tinsley Park – Just west of Downtown in Buffalo Bayou Park (between the 18 to 3600 blocks of Allen Parkway), this public gem offers a backdrop of the Houston skyline, as well as a massive lawn, lush green hills, a sand volleyball court, and access to running trails. With the Bud Light Amphitheater and the open-air Nau Family Pavilion, the park also hosts big events, including the annual Freedom Over Texas 4th of July fireworks show. Houston Police Officers’ Memorial – From the late, acclaimed artist and sculpture Jesús Bautista Moroles’, this striking memorial commemorates the lives of Houston Police Department officers whose lives were lost in the line of duty, shaped like a pyramid to symbolize a royal tomb. Johnny Steele Dog Park – Bring your four-legged friends to this two-acre dog park near Allen Parkway and Montrose, which offers a pond, pup-friendly water fountains, a lawn for running, dog washing areas, and shaded structures for those dog days of summer. Open daily 7am to 8pm. Gus S. Wortham Memorial Fountain – Dubbed the “Dandelion,” the Gus S. Wortham Memorial Fountain is a brass starburst of pipes, surrounded by benches, trees, and lush native perennial gardens and offering passerbys a cool respite from the Houston heat. Note: dogs are not permitted in the fountain. Waugh Colony Bat Bridge – Nearly every evening, Houston’s resident Mexican free-tailed bats emerge from their makeshift home underneath the crevices of the Waugh Street Bridge. The specific time the bats emerge is not completely predictable (especially after the colony was diminished during Hurricane Harvey), but warmer weather helps. For a unique look at the natural phenomenon, pontoon boat tours are also available. Lost Lake and the Lost Lake Visitor Center – Along Allen Parkway at Dunlavy, this visitor center offers restrooms and kayak, canoe and stand-up paddleboard rentals from Bayou City Adventures; while Lost Lake sits on the site of a former pond, working as a drainage facility and wetlands area. Hike & Bike Trails – Well-kept hike and bike trails and bridges wind along the park and its bayou, with the Sandy Reed Memorial Trail offering a ten-foot wide concrete path for cyclists, walkers and joggers; and the five-foot-wide asphalt Kinder Footpath located along the bayou’s banks. Illuminated by Lunar Cycle Lighting that transitions from white to blue as the moon waxes and wanes, the trails are also accessible as the sun sets. Click here for a trail map. Art in the Park – All along the bayou, you’ll find the park’s trails and spaces dotted with intriguing art installations, including British sculptor Henry Moore’s Spindle, a bronze abstract work that was originally part of the artist’s Spindle series in London’s Hyde Park; John Runnels’ It Wasn’t a Dream, It was a Flood, a 20-foot stainless steel canoe sculpture that serves as the entry point at Crosby Outfall; Open Channel Flow, a sculpture by New York-based artist Matthew Geller that features a hand-pump shower fittingly near the Lee and Joe Jamail Skatepark; and Jaume Plensa’s Tolerance, the stunning human sculptures that represent the world’s seven continents set at the base of the Rosemont Bridge on Allen and Montrose. Don’t forget to look out for the Monumental Moments, a series of six 4-foot tall sculptures depicting words like “Explore” and “Reflect.” There are also pop-up installations. In February of 2019, the New Monuments for New Cities public art project debuted in Houston, stimulating discussion on the evolving nature of monuments and asking what it means to “monumentalize a person, an idea or moment in time.” The structures will surround the Spindle along Allen Parkway at Gillette Street before traveling to Austin, Chicago, and Toronto, and finally the New York City High Line in September 2019. Sesquicentennial Park – Located in the heart of the Theater District near Wortham Center, this 22-acre urban space sits just off the Buffalo Bayou. Check out art installations, including the 70-foot-high Seven Wonders pillars, the George H.W. Bush Monument, and the Big Bubble, a bubble of water you can activate in the bayou by pressing a big red button over by the Preston Street Bridge. The Kitchen at The Dunlavy – Overlooking the lush bayou and Lost Lake, this striking “glass tree house” is packed with stunning chandeliers in all shapes and sizes. The Kitchen offers diners breakfast and lunch daily, as well as weekend brunch and an excellent selection of wine, beer, and grab and go bites perfect for a picnic in the park. Sip a glass of wine and nosh on an assortment of local cheeses and charcuterie; enjoy a light breakfast of avocado tartine and a strong coffee out on the patio; or treat yourself to a good ole’ burger and fries after a long bike ride. At night, the beautiful eatery doubles as a private event and dining space, opening to the public for the occasional pop-up happy hour and collaborative dinner (follow along on Facebook for updates). 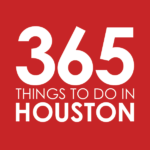 Nearby bars and restaurants – Check out our Where to Brunch and Where to Happy Hour guides for a look at some great food and drink options available near Buffalo Bayou Park.